Sichuan's provincial government has inked a series of cooperation agreements with the Hong Kong Special Administrative Region to further boost their relations in areas such as trade, service industries and cultural exchanges, according to local officials. In recent years, cooperation between the two sides has been strengthened, making Sichuan the fifth province and the first Midwest region to establish ties with Hong Kong. HKSAR Chief Executive Carrie Lam Cheng Yuet-ngor noted that Sichuan is an important economic center in western China and plays an important role in the country's Belt and Road Initiative. Hong Kong and Sichuan are complementary as the former is an international financial center and offshore renminbi business hub, which can provide professional services for Sichuan's B&R-related construction projects, Lam added. Boasting a population of 91 million, abundant resources and a large market, Sichuan is ready for a win-win agreement with Hong Kong, said Peng Qinghua, Party secretary of Sichuan province. Hong Kong has become Sichuan's most important source of overseas investment and the fourth largest trading partner. To date, 5,176 Hong Kong-funded enterprises have invested $56.7 billion in Sichuan, according to the province's information office. Sichuan-Hong Kong cooperation strengthened after the devastating earthquake in Sichuan's northwest Wenchuan in 2008, when Hong Kong provided HK$10 billion ($1.26 billion) to fund reconstruction projects. In the 10 years since then, the two sides have deepened cooperation in a wide range of facets. In August 2017, a total of 26 cooperative projects worth $20.4 billion were signed at the Sichuan Promotion Conference on International Cooperation under the Belt and Road Initiative during the Sichuan- Hong Kong-Macao Cooperation Week held in Hong Kong. The two sides have also called for cooperation in advancing the Belt and Road Initiative. "Sichuan puts a top priority on 'promoting international cooperation on the Belt and Road Initiative', facilitating China's development goals while securing an enabling environment for its own development," said Commissioner Xie Feng of the Ministry of Foreign Affairs in Hong Kong. Sichuan has long been welcoming Hong Kong-based firms. For example, Swire Group, a real estate giant from Hong Kong, has been doing well in Sichuan since entering the province in 1990. It has built Chengdu's landmark Taikoo Li and opened up channels for more business. Taking off from estate and retailing, Hong Kong-based firms have expanded their development to finance, insurance, preservation, logistics and manufacturing, said Margaret Fong Shun-man, executive director of the Hong Kong Trade Development Council. Meanwhile, Sichuan-Hong Kong cooperation on medical care, education, culture and technology is bearing fruit. Two-thirds of 200 therapists in Sichuan- Hong Kong Rehabilitation Center offering post-earthquake health service support have taken training courses in Hong Kong, according to Huang Lin, a doctor in the Sichuan provincial hospital. In addition, an increasing number of young people from the two sides are engaged in exchange programs. One example is the Youth Internship Program at the Wolong National Nature Reserve in Sichuan, which recruits young people from Hong Kong and Guangdong province to participate in a six-week internship program. They will be provided with professional training to understand nature conservation and ecotourism development. Sister schools between the two sides have increased to 34 pairs. More than 600 youngsters from Hong Kong are scheduled to study and work in Sichuan with the fellowship by the Hong Kong government, said Jack Chan, Hong Kong's undersecretary for home affairs. 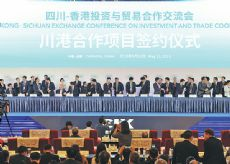 "Exchanges among young people determine the height and depth of future cooperation between Sichuan and Hong Kong," added Han Jin, president of Friends of Sichuan Association (Hong Kong). Sichuan and Hong Kong are seeking to "shorten" their distance, he said. There are 12 flights between Chengdu, capital of Sichuan province, and Hong Kong. And rail passengers are expected to spend only eight hours on their journey between the two regions once the Chengdu-Guizhou high-speed railway extends to Hong Kong in the years ahead.